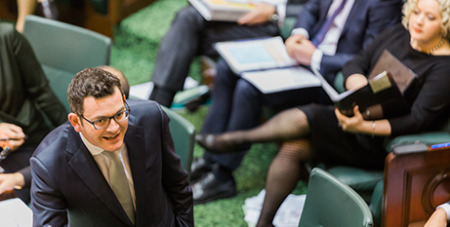 Victorian Premier Daniel Andrews has flagged the idea of opening Parliament with a multi-faith ceremony instead of the Lord’s Prayer. Source: ABC News. At the start of every day, the Speaker and President lead the Lord’s Prayer in the Upper House and Lower House. Greens MPs wait outside for the prayer to finish before taking their seats and have long advocated for change. Crossbench MP Fiona Patten has also been calling for change, saying the Acknowledgement of Country should open parliament. Yesterday, the government referred the Lord’s Prayer to the procedures committee for review. Mr Andrews said he was open to the idea if it had widespread support and would be welcoming of other religions. “If it were a multi-faith moment if you like, at the beginning of the parliament day, perhaps that would be more reflective of what modern Victoria looks like,” he said. But he said it was also important to conserve some traditions. State Parliament has opened each sitting day with the Lord’s Prayer for the past 100 years, but in recent years has also included an acknowledgement of traditional owners, which Liberal MP Bernie Finn has refused to stand for. The Opposition does not support any change, Upper House Liberal leader David Davis said. “It’s a very important part of our history, it’s a very important reflection of the Judeo-Christian tradition,” he said.